I love the fact that blogging brings us many new friends and an added treat is when one of them decides you should be given an award! This is my 3rd Blog Award, and I'm chuffed! 1. I came to Australia with my parents in 1971. I didn't want to come but am so glad I did. 2. I have a dream to save vast amounts of Australia's scrubby bush for Merrilyn and her descendants/cousins. 3. I've had 3 books published, two via a publisher, (Simon & Schuster), and a kangaroo care manual I self-published so people could have it for free. (Link in side bar if you're a carer). 5. I was almost killed by an elephant in India. You can read a brief version of the story here. 6. I am a breast cancer thriver. I wrote a bit about that here. 7. My current favourite saying is "When you find the right song, the voice appears." 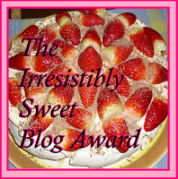 So now to pass this gorgeous award onto 5 other deserving, irresistibly sweet blogs. 1. Catbird Scout. Deb Shucka writes beautifully. I rarely visit this blog without finding deep feelings within. If you've never been to Catbird Scout, please give yourself a treat. 2. By Word of Mouth Musings. Nicole runs some super link ups including "Time Travel Tuesday" and "Wordless Wednesdays". Thanks Nicole for working hard to enable us to make new friends in the blogosphere. 3. The World From My Window . Maddie's "tales of England's rural underbelly" blog was one of the first I visited and I was hooked. As I creep towards 100 followers Maddie gallops towards 1000 and just one visit to the enchanted village to meet the likes of Mr Sheepwash, Posh Totty and Randy Munchkin will have you wanting more too. 4. Paws4Thor As his author Mum writes: This blog is about one boy's journey to get a helping paw - an autism service dog. Go and take a look and click on a couple of buttons to show your support and help Erin and Thor create their dreams! 5. New Day New Lesson. It's easy to moan, but that's not Susie's thing. Susie is changing the world, one positive post at a time! If you're looking for kindness, positive thinking or inspiration, go and give Susie a visit. 2. Include 7 random tidbits about yourself. 3. Pass award on to 5 others and link to their blogs. 4. Let the people know you've given them the award. To spread the happy word I've also added this post to Free Fringes Love Links 12 - check it out. I read both linked pieces of your writing. The first I don't recall, but I have a vague recollection of the second link, the terrifying one. What a terrible experience. Sounds like you've been living a rich life. I love reading about your kangaroos. Anyone with such love to give is definitely deserving of the sweet blog award. You were almost killed by an elephant? Wow. Hey, thanks for participating, as well as the shout-out!! Great answers......and FABULOUS site. Give all the 'roos our love. Now - how do I go about making a website button like you have???? I am very impressed by what you said regarding the kangaroo rescue, the "almost getting killed by an elephant in India," and the two book by Simon and Schuster, like it's no big deal, and of course the breast cancer survivor. You are one Gutsy woman in my opinion and deserve that award from me. It was great getting to know you better in this way, Cheryl. And I can't thank you enough for your kind words and inclusion in such wonderful company. I'm off to check out my new friends. Thanks for linking at this week's lovelinks! I'm honored to have such an adventurer in my blogging circle. These days, danger for me is trying a new flavor of frozen waffles. *stands and applauds* I'm honored to meet a cancer thriver. Thank you for sharing this. Yay for Cancer Survivors (Thrivers)! Love that term. You lead a life I envy. One day, mind you, one day I will leave the "comforts" of home (US) and travel the world. Wow, thanks for the facts about you - I know you better now Cheryl, and what you've been through in life. COngrats on your awards you totally deserve them all. You are Irresistibly Sweet! I like #6. : ) Never heard that before. Great term! Congratulations on your award, well deserved! Congratulations on your award. You definitely deserve it! THANX!!!! Always an honor to be in someone's award list! Many thanx to you, and thank you for the time you put into visiting and commenting- so very appreciated! PS. WW is up and ready for a new week! Wow. I am relatively new to blogging, so I am not familiar with the whole awards thing (I mean, I kinda get it, and I'm ready to give one, but not really sure how it all goes). This is very cool. I like how the links to the people giving and receiving the awards are there. Yeah. I like it. I love getting to know you. Yes, your blog is beyond sweet. With a message!